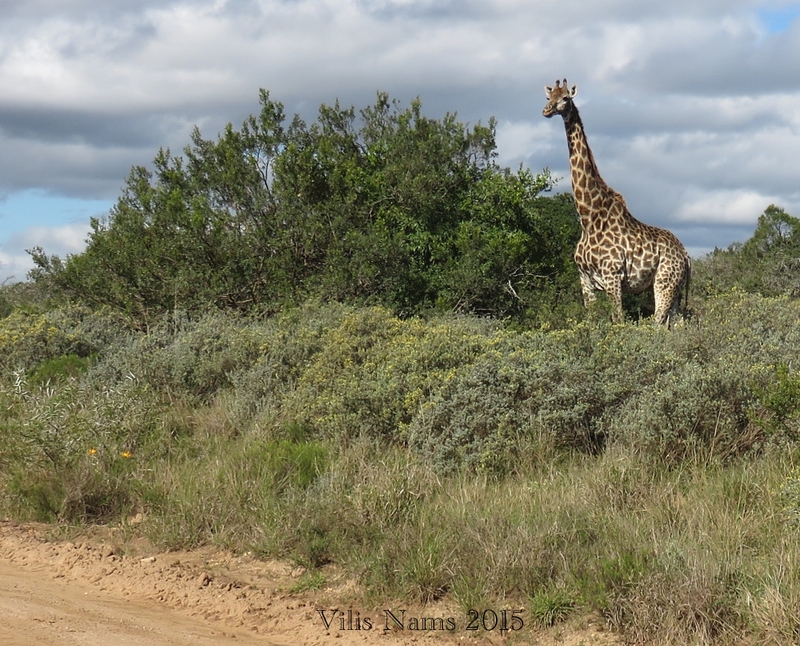 Vilis and I have lived in Grahamstown for three months and discovered that in South Africa’s Eastern Cape province, wildlife is big in a commercial, as well as natural, way. 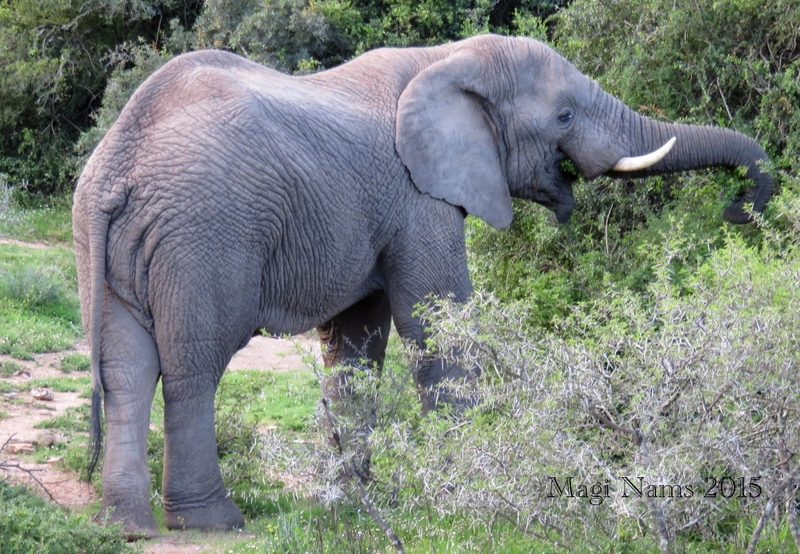 National parks – Addo Elephant, Mountain Zebra, Camdeboo, Garden Route – attract visitors from all over the world and offer guided game drives and walks (even horse rides in the Big Five area in Addo). 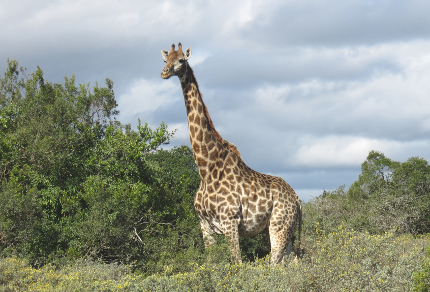 Eastern Cape provincial parks and nature reserves offer more opportunities for wildlife viewing, as do at least a dozen private game reserves in the province, more than half of them within an hour’s drive of Grahamstown. All these provide plenty of opportunities for money to disappear from the wallets of visitors and enter the South African economy, which is good for the country. A little history now. 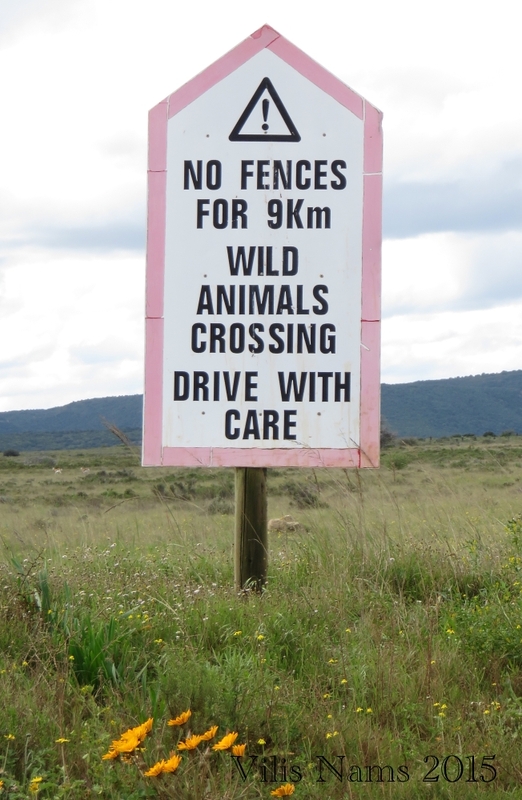 In the 1990s, many drought-stricken farmers in Eastern Cape converted from growing crops and fruit, and in some cases, livestock, to farming wildlife. Or they sold out to people interested in farming wildlife. The rationale was that wild animals (some native to the area and others imported from farther north in southern Africa) would be more suited to Eastern Cape conditions than the domestic animals or crops had been. Hence, the current abundance of game reserves. This buy-up process continues as game reserves seek to expand in order to take advantage of ecotourism and trophy hunting dollars. 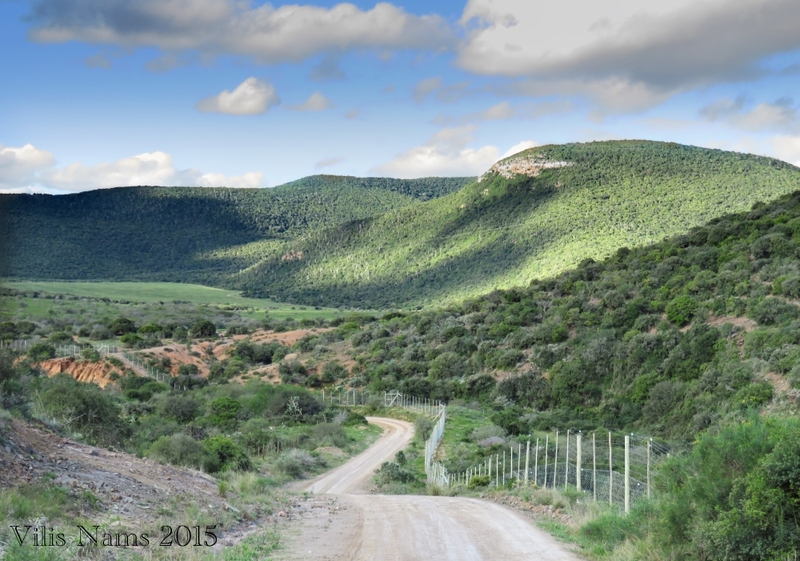 Recently, Vilis and I did a poor man’s game drive through Shamwari Game Reserve southwest of Grahamstown, so Vilis could have a look at the terrain. He’s gathering big cat (lion, leopard, cheetah) movement data from studies conducted in South Africa, Botswana, and Zimbabwe, with a view to analyzing home ranges in fenced vs. unfenced areas. One data set is from Shamwari. Vilis thought that visiting the research locale would provide insight into factors – like topography and vegetation – that he’ll need to consider in his analysis. Needless to say, I went along for the ride. 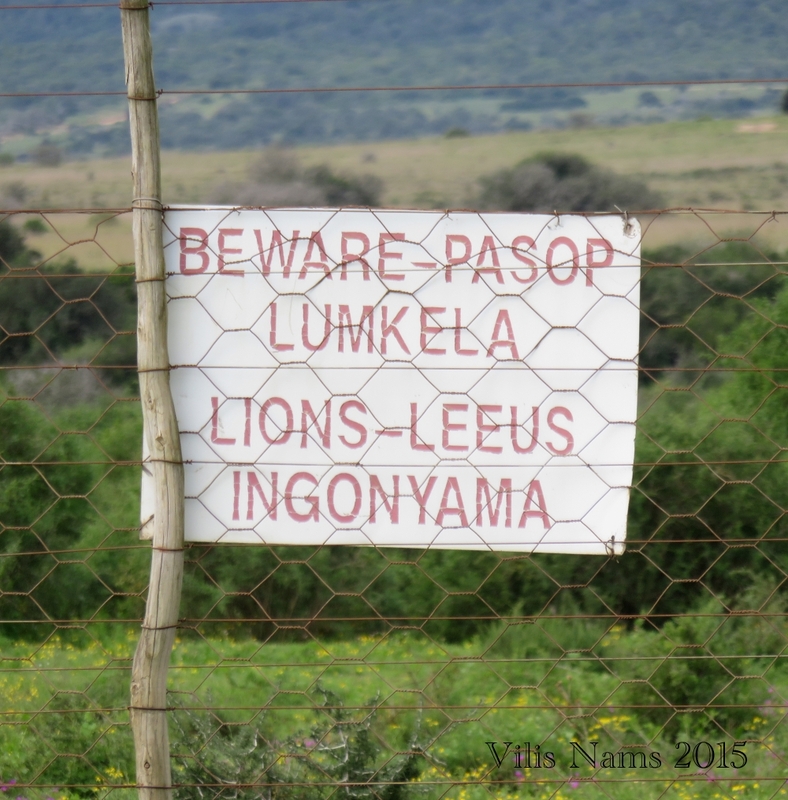 Shamwari is a Big Five reserve, so the high, electrified fence was posted with a lion warning sign in three languages: English, Afrikaans and Xhosa. After we passed through a gate, where we had to sign in and provide our vehicle licence number and a cell phone number, we encountered other warning signs for the traveller of the public road. 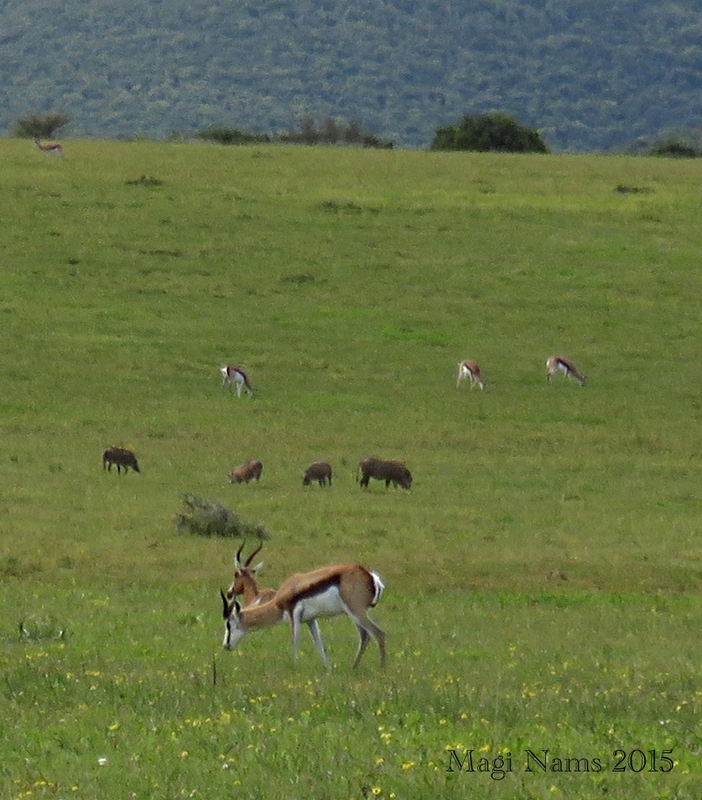 All this piqued our interest, which stayed high as we drove over a grassy plain grazed by springbok, warthog, blesbok and red hartebeest and then into rolling, wooded hills. A Shamwari security truck passed us, likely checking us out. We exited the reserve at a second gate and entered it at a different location to view another section of the reserve. Again, we checked in, and again the security vehicle just happened to cruise past us while we drove along slowly, trying to get a good look at the first South African tortoise we’d seen. 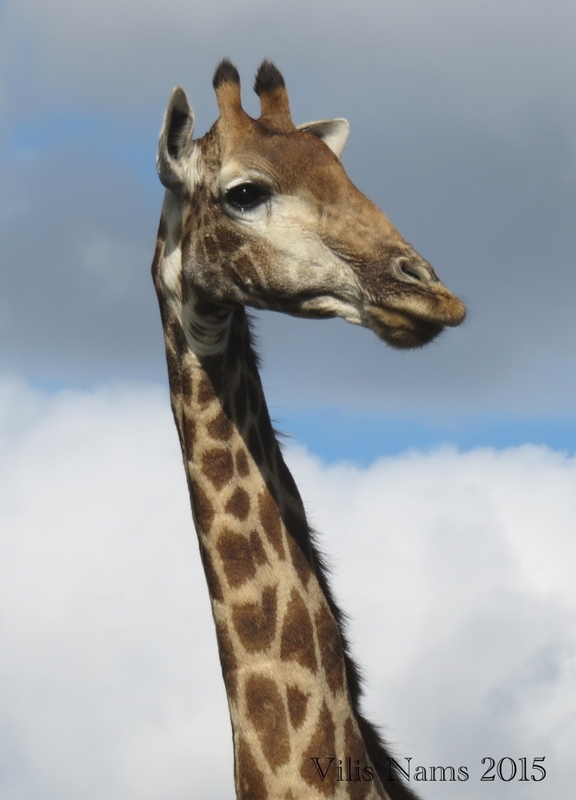 We spotted a giraffe feeding in thicket vegetation near the road, and farther along, an African elephant ripping branches off a thorn tree. We exited the reserve for the second time and entered it for the third at yet a different spot, again on a public road. Again, we signed in, and – you guessed it! – again the same security vehicle drove past us. This time, Vilis waved to the driver. “That was really helpful for me,” Vilis told me enthusiastically as we left the reserve. 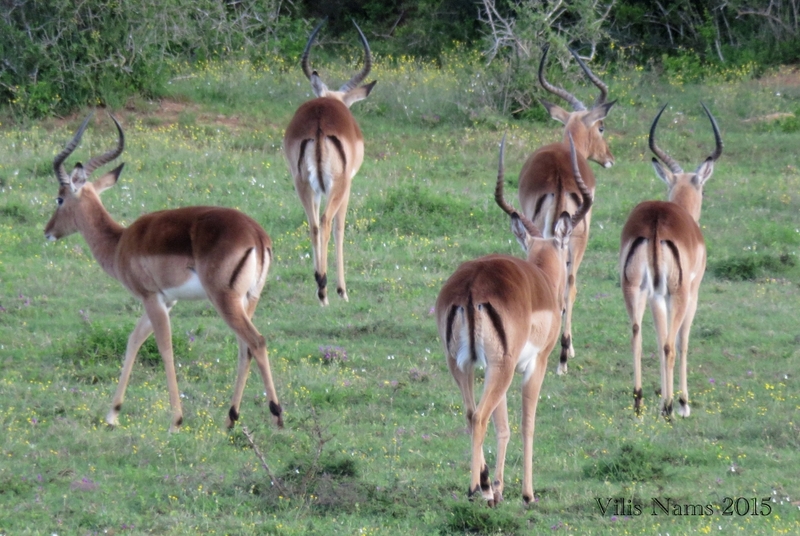 “Seeing the hills and valleys will more clearly help me to connect with the animals’ movements.” So, there we have it, another tool added to the arsenal of wildlife research techniques: the poor man’s game drive.